Communication is a core skill for stakeholder engagement.Earlier blogs in this series introduced the communication spectrum and looked in more depth at its engagement and appreciation aspects. This post explores how listening fits with the communication spectrum. Listening, as with communication, is generic. The communication spectrum helps us to be more specific about the type of communication we want to use, and the same principle applies with listening. For those who haven’t had some sort of coaching or training in listening (the majority of us? ), listening is undifferentiated. Some may have learned about active listening. Part of the problem is that good listening, while outwardly passive, takes a lot of focus and discipline, and it’s a little hard to simultaneously listen, and stand back an observe yourself in action. 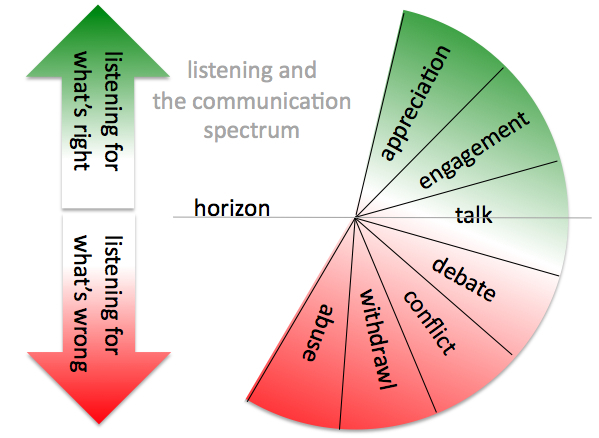 Using the communication spectrum, we can identify three zones of listening. In the neutral zone, our listening can be passive and possibly not very effective. We might be disinterested or bored. If our interest is piqued, we might either move towards being more engaged or, on the other hand toward debate and conflict. If our listening heads south towards the red zone we begin to listen for what is wrong. You have probably caught yourself doing this – what started off as a conversation, at some stage became a contest. A clear sign is that you find yourself trying to score points and the communication takes on the pattern of strike and counter-strike of a rally in a tennis match. In formal debates, speakers have their own material to present, but are also listening to find fault in the arguments of the opposition. Debate in our democracies unfortunately operates on this premise, often yielding more heat than light. If the communication heads for the green zone, the listener will draw on skills of rapport building, empathic listening or active listening. For some, these skills have developed non-consciously, others work at them. Expressing appreciation to others needs to be preceded by either observing, or listening for what is right about that person. Communication skills are a core competence for any organisation aspiring to better stakeholder engagement. Improving staff communication skills, in either listening, speaking or writing, equips your staff to engage better internally and externally. One skill especially relevant is empathy. When working with people on engagement processes such as stakeholder mapping, or identifying materiality, I encourage them to think from the stakeholder’s perspective. It takes some practice – it is very easy for people to revert to their own perspective. I suspect this is because most of us are keen to maximise advantage for our organisation. Stakeholder communication calls us to be more nimble and inclusive in our thinking, listening and speaking. Stakeholder mapping is a key process for formalising your stakeholder engagement. Follow this four step process to establish a stakeholder map. Using a matrix to rate the factors that determine the relevance of each stakeholder group will provide another perspective on your business. How you achieve this will, to some degree, will be determined by the size of your organisation. Assuming you don’t have huge resources at your disposal, what I suggest here is a pragmatic four step way to map stakeholders. the potential for creating or enhancing shared value. Select the factors that are most relevant in your first attempt. I especially recommend you include the last – creating or enhancing shared value. This is the factor that most aligns your stakeholder engagement with the win-win orientation of Sustainability 2.0.
column, and the factors you have chosen in the top row. In your first attempt, brainstorm to identify a list of stakeholders and then rank each factor, using a numerical scale, for each stakeholder group. I suggest a scale of 0 (no relevance) to 3 (high relevance). You might want to weight those factors that are critical so the numbers are potentially higher, but I recommend you start with unweighted factors to keep it simple – it will work. Here’s an example. 3. 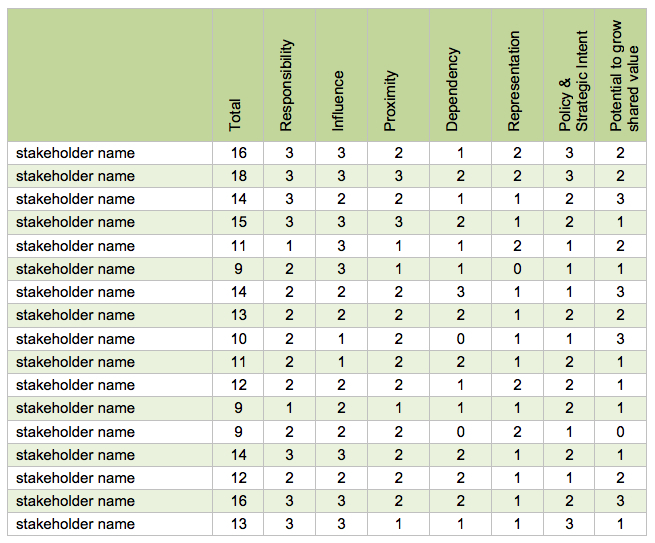 Sort the matrix so stakeholders are ranked with those scoring highest at the top. Use a one-page matrix to consult with your colleagues (any more than one page makes the process too unwieldy). In meetings, conversations and workshops get your colleagues to rank stakeholders to establish a ranking that has broad consensus internally. 4. Indentify your top 10 or so stakeholders and focus on these for the first year of formal engagement. This will pilot your processes and help to focus your engagement efforts with a range of stakeholders, and hopefully get some runs on the board. As you engage, you will unearth other stakeholders. In subsequent years, include stakeholders in this process and build from the initial 10 to a larger number. As with other stakeholder engagement processes, some staff will find rating stakeholders challenging, as it requires them to consider their world from their stakeholder’s perspective. Expect this shift of perspective to be the first of many benefits from this process. 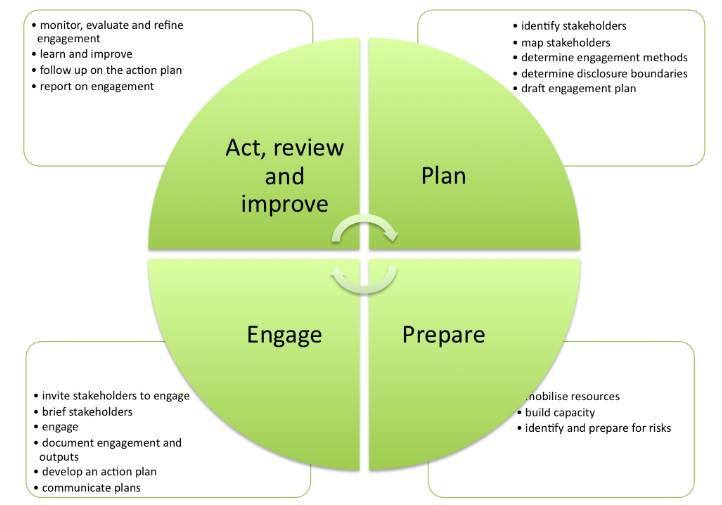 Many sustainability processes, such as Accountability’s excellent AA1000 Stakeholder Engagement Standard (AA1000SES) are complex and require significant resources to implement them to their full extent. This poses a problem for small and medium enterprises (SMEs), as the resource requirements for implementing the system, could well divert those resources away from the business end of engagement. Unlike clothing stores, many business systems are designed for the biggest in the business. When smaller businesses try those systems on, they find they are not necessarily designed to scale down. I live in a small city in a small country (New Zealand) that has a smaller GDP than dozens of corporates – so even our largest companies are comparatively small. Another level of complexity, is that standards such as the AA1000SES are relatively new and still rapidly evolving. The AA1000SES is currently in the final stages of a major revision, so those that use it need to invest in ongoing development in the use of the standard. (Accountability’s revision process in itself is a stunning example of engagement, as the revision takes place online in a wiki, inviting contributions and comments). 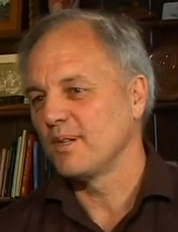 So how do we garner the benefits from formalising engagement, while minimising initial costs? The AA1000SES currently has a four-stage engagement process consisting of 18 steps. And note that this is the heart of the process and does not include the strategic context or assurance processes. In simplifying the process there is always the possibility of eroding its value, but I believe that it is better to make a start and scale up, rather than wait for all the necessary resources to be available. Surely at the heart of the engagement ethos, is not the need to polish the veneer and look good, but rather to get to a point where we can engage in honest dialogue – and thus attain a better understanding of each other as a sound foundation for business sustainability. reflecting and revising the plan. Mapping stakeholders can be done with a small cross-section of staff, especially those with deep institutional knowledge and local connections. Ask this group “who are the stakeholders that we impact, or impact on us, we have some moral or legal responsibility for, who are geographically close or are relevant to our strategic intent?” Each of these factors can be scored on a scale of 0 to 3 (low to high relevance), and then ranked by total score. 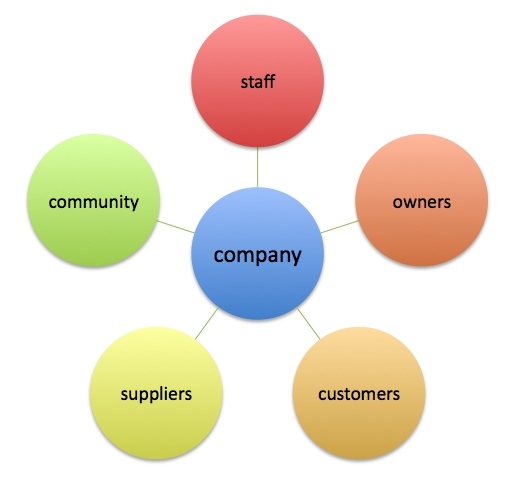 You will find that stakeholders such as staff and owners will be prominent, but some, more external, will also feature. I advocate starting with the top 10 stakeholders and focussing your efforts on them (more about this in the next blog). Material issues are those issues of concern to your stakeholders. Its good to attempt to quantify these before launching into engagement. Again a mapping process is useful. This time, consider the impact of this issue on both you and your stakeholders, the potential for impact and the potential for positive change (to what extent can you improve with this issue?). What you will find fascinating with this process, is that it forces people to look at the issues from another perspective, sometimes, not easy to do. Again, you will end up with a ranked list. When you eventually engage, you will at least learn about any perceptual gaps between you and your stakeholders. 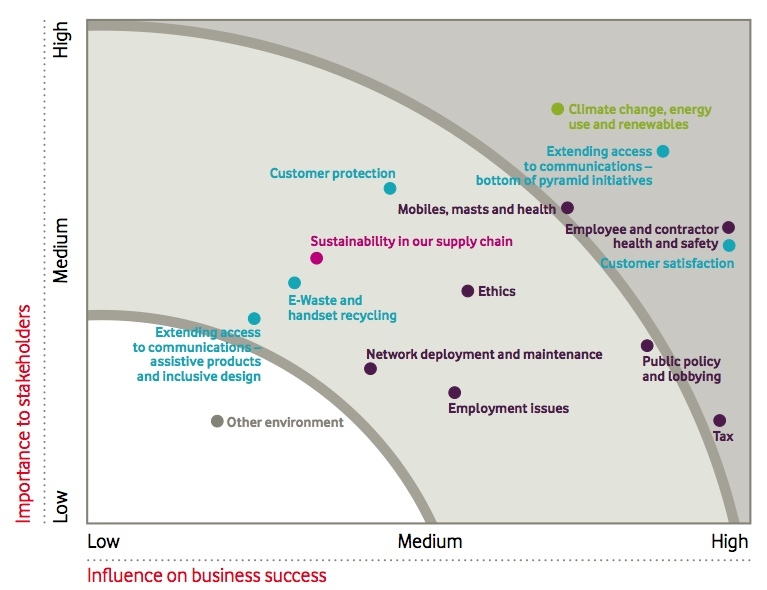 Here is Vodafone’s mapping of material issues from their 2010 Sustainability Report. Future blogs will deal more with the planning, reflecting and revising, so now lets consider engaging the engagers and building capability. Each stakeholder group is linked to someone who will lead, or at least monitor engagement. For some groups, there will be natural internal candidates, for example, client stakeholders might be linked to sales or manufacturing personnel. Those external stakeholder groups that don’t have a natural internal partner may need to be linked to a staff member charged with engagement. You will now need to consider how well equipped this core group, and the wider organisation, is equipped to engage. The good news here, is that the skills and knowledge required to support good engagement – leadership, learning, communication and adaptive capacity (change), also support organisational development. The aim is to have all staff as enthused ambassadors for the organisation. Rather than wait for everyone to be totally equipped, at the very least, articulate these values and ensure that they are modelled from the top. The first round of engagement can test the assumptions from your internal dialogue. Initially it is best to engage with each stakeholder in the method most appropriate for them. Ideally you will learn where you are doing well, and where you can improve, and it is in the latter where exciting opportunities may await. Engagement is an action learning process, so while engagement will be happening in different ways with different stakeholders, work to a consistent timeline for reflection and revising your plans. Over time, as you complete more cycles of planning, engaging and reflecting, you can gradually align your processes more formally to the AA1000SES –and be a little more like the big boys.